Description: measuring almost 50 centimetres in wing span, this flying behemoth is undoubtedly the largest Pteranodon figure of all the JP toy lines. Because of its size there’s also room for a broader range of actions and sounds, making it a very playable toy. It also has poseable legs to match. Qua action features it’s not particularly imaginative: it's mostly the usual Pterosaur options. First, there is the biting beak: pressing the crest makes the beak open as if the animal is snapping at some poor piece of prey. Second, there is the wing flapping mechanism. Third, the fold-in wings: the outer half of each wing can be folded inward (outward too, but that just looks silly), as if the creature is adjusting its flying pattern. It looks very much like the Pteranodon is diving towards its victim when the wings fold inwards. Additionally, there are the sounds, four in total. The attack screech can be heard when activating the biting action by pressing the beast’s crest. The wound noises are produced by pushing the button in the dino damage wound (located on its right flank, revealing four white ribs and red muscle tissue). The other two sounds can be made by pressing the button on the back which makes the wing flap. Pressing it once and releasing it, or pressing it several times over, produces flapping sounds, while pressing it a bit longer activates a swishing noise, as if the Pterosaur is swooping down on its prey. Green is the colour of choice for this Pteranodon. Except for its underside (lower half of the throat and belly), which is painted white, virtually all of the body is green. The torso, hands on the wings and base of the wings are coloured dark green for the most part, while shapes, spots and stripes of this colour are also found on the rest of the figure, most notably on the wings. Light green covers the remaining body parts, most obviously on the rest of the wings, the head and the legs. Neither shade of green could be called dominant though, both gradations of green play an equal part. The top half of the crest on the head is painted blue, covered with dark green spots, while below this blue colouring blue spots are found on the base of the crest. The figure has a long pink tongue, small yellow eyes with black pupils and a large white JP logo on its left upper leg. Analysis: just a year after its JPD2 repaint release, this big Pteranodon sees the light of day again for JP Dinosaurs 3. Why ignore a good sculpt if you can milk it dry after all? But if repainting has to happen, then it's preferable seeing good sculpts getting a makeover. This Pteranodon has a solid new paint job: though green is an unusual colour for Pterosaurs, it suits it well enough. The paint scheme is not that dissimilar to that of its JPD2 predecessor, but not an exact match either and the colour use is definitely a completely different thing. The random interplay between both shades of green works well and gives it a sort of natural chaotic look. The blue coloured crest is also a good addition, maybe hinting at this Pterosaur's social status or desire to mate (though that's undoubtedly not the feeling Hasbro was aiming for). Overall, some extra detailing might have been nice, like differently coloured claws on hands and feet, or the inside of the mouth, but this paint job looks good regardless. Too bad the dino damage wound remains ever present, but surely we got over this nuisance by now. All original action functions are also still in use, including the biting beak, flapping and folding wings and the four different sounds. However, as is the case with the other electronic Hasbrosaurs from JPD2/3, the used electronics are of poor quality, making it increasingly difficult to find specimens in working order. A real shame, but this sculpt provides enough fun otherwise. Repaint: yes. 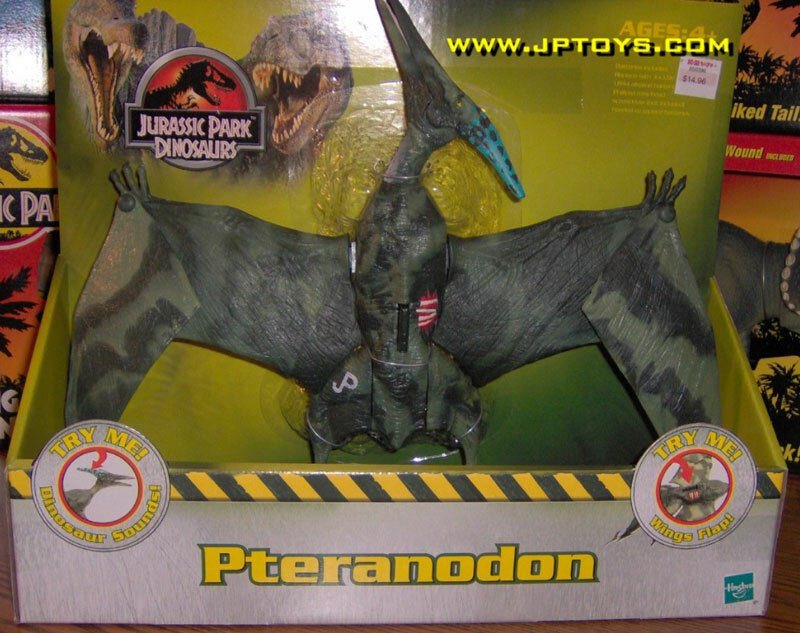 This is a repaint of the JP III Ultra Alpha Pteranodon figure. The sculpt has been repainted for JPD2 prior to this third release. So far, it has not been repainted since. Overall rating: 8/10. This is still one of Hasbro's finest sculpts, impressively sized and loaded with playability features. The new paint job is quite different, but also rather good. Like the other big JPD2/3 electronic dinosaurs, this figure was common a few years back, but, insofar as availability, its numbers are in swift decline. With luck, you can still find one for a decent price, but don't expect this situation to last much longer.